Express Large Format Posters | A2 | A1 | A0 | 2A0 | B1 | 20"x30" | 30"x40"
Large Format Posters: Do you have an important message which needs to stand out from the crowd? When you want your message or graphics BIGGER, get your customers to notice your message from further away, COMMAND ATTENTION! 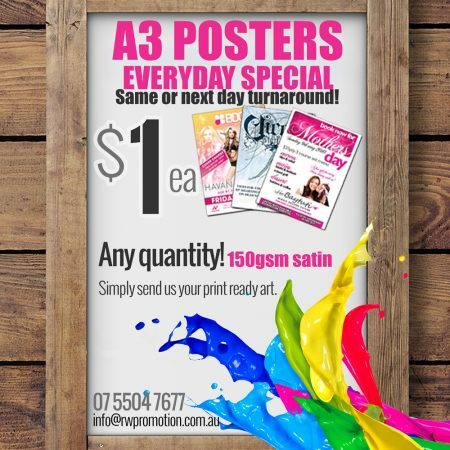 Coupled with a great design, our high resolution, full colour, indoor or outdoor posters are not only eyecatching but economical and sensational quality. Available in a wide variety of substrates and sizes. You can mix and match design & prices with large format poster pricing. If you purchase a range of different sizes you get them at their respective large quantity rates instead of single rates. 200gsm satin. EXPRESS TURNAROUND – Get your posters in days, not weeks! Other substrates available – contact us for our full range and a free quote! Local pick up is also available from our Gold Coast factory located at 5/20 Strathaird Road, Bundall! A2, A1, A0, 2A0, B1, 20" x 30", 30" x 40"